The quest for interesting vegetables is constant on a low-carb high-fat diet. Vegetables are a key source for variety of the diet. The best vegetables to eat on a low-carb high-fat diet are green leafy ones that grow above ground. In general, any vegetable grown above the ground is a safe bet. Root vegetables such as potatoes have always been off the menu. However, I’ve heard a number of low-carb experts talk enthusiastically about the sweet potato. It seems that sweet potatoes have a reputation for being relatively low-carb, ar at least having carbohydrates that are slower to be absorbed into the system then other root vegetables. it seems ironic, considering the name of the vegetable includes the word sweet, and sweet potatoes do have a definite sweet taste. 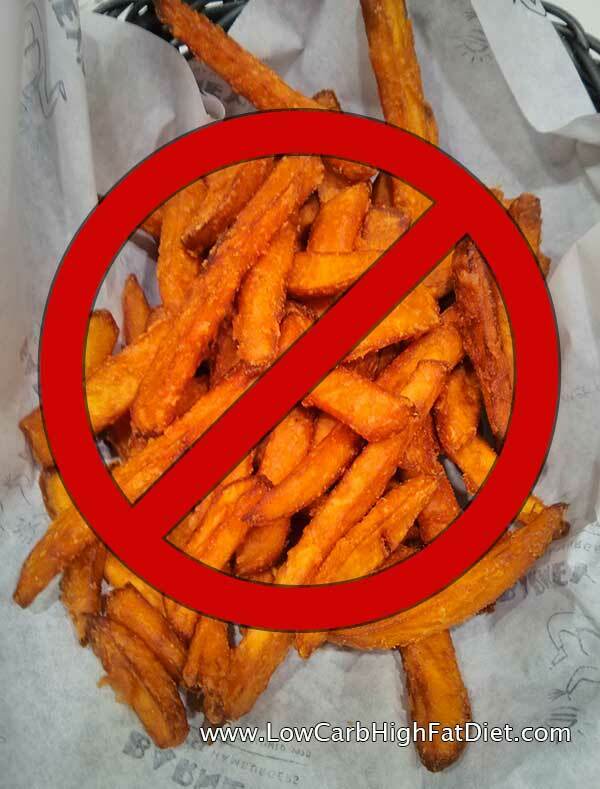 I was recently out at a restaurant where you can order sweet potato fries along with your burgers. Of course I was eating a burger, and I had ordered it slathered in cheese and a rich fatty garlic aioli, hold the bread. But I saw the sweet potato fries on the menu, and I thought I’d give them a try. They also came with a fatty mayonnaise-based dipping sauce, and I was optimistic. I bit into one, and it was remarkable how sweet it tasted. And I noticed that the sweet potatoes themselves had almost caramelized in the process of being fried. As if the sugar in them had heated up to the point of becoming a candy. After avoiding sweet foods for a while, you really notice a sweet taste in your mouth. The sweet potato fries just didn’t feel like a low-carb option to me. So I pulled out my phone right there at the table and did some research. It turns out that sweet potatoes actually have a very high carbohydrate count, and a lot of those carbohydrates comes in the form of starches. However, sweet potatoes have a surprisingly low glycemic index. This means that the body doesn’t interpret sweet potatoes as an instant source of sugar, even though sweet potatoes to carry a lot of simple carbohydrates that will be available to turn into sugar in the body. After my second fry, I stopped myself. There was no way that these fried sweet potatoes were actually low-carb. And for me, my instincts were correct. I noticed myself thinking about food in a less than objective way later that day, and I attributed it to the sweet potato fries. It’s so important to learn how to hear what your body is telling you, and trust it. So the bottom line is that sweet potatoes to have relatively high carbohydrate count, and are quite starchy, but may not cause the instant insulin spike that a white potato might. Does that make them a good choice for low-carb high-fat dieters? I wouldn’t think so. Your mileage may vary.